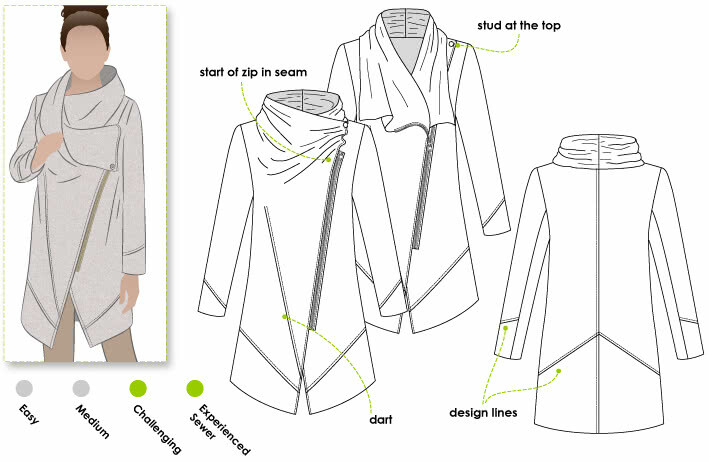 Posted on November 18, 2017 November 19, 2017 by catherinedaze	This entry was posted in dressmaking, Finished, grey, jackets, sewing, Style Arc and tagged dressmaking, grey, jacket, sewing, stylearc. Bookmark the permalink. So happy you did this post. I like the design lines and love the collar in this pattern. It looks as though it would adapt to many fabrics, and is of the moment without being over the top. Wow — fantastic coat. I love that collar. Looks great. I love the collar and asymmetric zipper. what a perfect silhouette for you, it looks fantastic and dramatic. and the fit seems just right. love it. What a great looking coat. I love diagonal lines. Looks like the perfect fabric too, and it’s always a bonus I think if one doesn’t have to line it. Love it! Great drama – and a warm neck (protected from the winds). It’s perfect. I love the color, the fabric weight, the length…everything!!! Wow, this looks fabulous! Love the fabric and shape so much. My favourite bit is the collar and how you can play around with the different positions. What a gorgeous coat! You did a wonderful job and it looks great. I thought this would look good on you and it does! Well worth all the work that went into it. What a fantastic coat! I always admired your style, and this fits right in. I love it paired with the leather look leggings and boots too. And I completely second your loath of hand sewing, I am truly in the same camp. Thanks for the zip link. I am looking for a nice puller for my next coat too! Hope you get loads of wear out of it! It looks great on you! I love the neck – I used to have a cardi with a similar collar and keep wondering how I could replicate it – this could be it! Wow, that collar looks great – very Rick Owens-y. I love Style Arc for their high fashion dupes! Your reviews are always helpful and your wardrobe is really an inspiration for me! Thanks for blogging this. I love it! I have their Marie cardigan pattern (that I am wearing now funnily enough) which is a similar style. How does the jacket look if you wear it unzipped or is it one of those asymmetric styles that needs to be worn done up? Thanks! It doesn’t look great unzipped…not awful but I wouldn’t want to use it as a cardigan. Dramatic yet very wearable! Stunning jacket and well worth the trials and tribulations. This looks so awesome! It’s a perfect compliment to your pants, and it looks like you will get a ton of us from it. The zip is very cool. I’ll definitely check out the source (at home) as I’d love to find more interesting zipper details, so thanks for sharing that. Anyway, looks great, enjoy your super stylish jacket! Very “Blade Runner”ish! No spoilers, I haven’t seen it yet! Glad it all worked out for you!